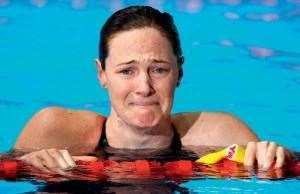 Malawi-born world champion Cate Campbell will be on our side at the Comm Games. Cate Campbell conquered Barcelona, and the rest of the swimming globe, at the Worlds in 2013. Photo: Getty Images. It’s hard to fault Campbell for being excitable as she looks to her season ahead, or to even fast-forward the next couple of years to Rio. She stands tall, rather literally, among the swimming world’s elite in the sprints, the current world champion in the 100m freestyle and no.2 in the 50m free, accomplished last year in Barcelona. With James Magnussen’s corresponding win, Australia claims both of the leading figures in the pool’s blue-ribbon event, a first since the era of Dawn Fraser and John Devitt’s victories at the 1960 Olympics. Last February, Campbell was named Swimming Australia’s swimmer of the year. It’s a status that seemed foreordained when she first emerged at the 2008 Olympic trials as a 16-year-old, finishing second in both sprint swims to a world record-setting Libby Trickett. In Beijing, Campbell beat Trickett to claim bronze in the 50m, and the hand-off from one generation’s star to the next appeared complete. ONE ENTRY in the Cate Campbell bio immediately jumps out: Malawi. The landlocked nation at the southern end of the East African Rift is one that doesn’t figure too often in the origin stories of Olympic champions. A longitudinal sliver wedged between Tanzania, Zambia and Mozambique, a fifth of the country is covered by a lake known either as Malawi or Nyasa, and is one of the great lakes found in the Rift Valley: only Victoria and Tanganyika are larger, and the latter is the only one deeper. Beyond geography, the lake is the dominant feature in the cultural life of Malawi: source of commerce and recreation, common point of reference, vital resource to the storehouse of scientific knowledge. Like the Galapagos Islands, the lake is one of the prime locations in the world for studying evolutionary development – the diversity of Malawi’s cichlid fish is an example of how species adapt to differing environments. The colourful fish have become central to the lake’s character – seen from space, Lake Malawi even looks like a flapping fish. The highlands south of the lake, just below the fish’s tail, have been an area of European settlement since the 19th century. The famed explorer David Livingstone helped establish a British presence – the main centre of Blantyre was named after Livingstone’s birthplace in Scotland. Malawi became independent with the end of Britain’s African colonies in 1964 and distinct from its neighbours was the only African country to maintain diplomatic relations with South Africa during the apartheid period. The two countries have a history of exchange, which included Campbell’s parents, Eric and Jenny, who left South Africa after Eric took a job with a bank in Blantyre. That teenage prodigy is now one of the most intimidating presences in the pool. Photo: Getty Images. Cate was the eldest of five siblings born in Malawi, and bears memories of a place both strikingly different yet supremely bucolic. “Growing up in Africa, it’s the funnest place to be a kid,” Campbell says. “I almost want to go back and have my kids in Africa, because I had so much fun. The Campbell kids enjoyed an upbringing that was appealingly rustic: surrounded by pets, they spent their time collecting the eggs from their chickens and chasing their guinea pigs. Cate devoured books: classics, historical fiction, Jane Austen and the Brontes. Family trips were spent at cottages by the lake, and the Campbells’ connection to the water ran deep – Eric was a sailor, while Jenny had competed in synchronised swimming, and was the one who would encourage her children to dive in. Where Australian youths take to the surf hearing cautionary tales of great white sharks, Cate and her siblings were raised on warnings about hippos. Suggest to Campbell that her situation sounded a bit like the plot of the Lindsay Lohan movie Mean Girls, and she laughs. Swimming would prove to be a place where the young Campbells could speed their assimilation. Cate, with sister Bronte, found her way to Simon Cusack at the local club in Indooroopilly, and he remains their coach to this day at Brisbane’s Commercial Club. Cusack couldn’t help but notice the different provenance of this pair, once remarking that they were just more resilient than the typical Australian kid beginning the hard slog that leads to glory in the pool. Like other Australian sports suffering recent downturns, swimming has been caught up in a rather sweeping critique of Gen-Y shortcomings. The case of the Campbell sisters certainly provides more fodder – the material for the classic, hard-going Aussie swimming champion had to be sourced out of Africa. Campbell admits to a bit of mystery in her relationship to her sport. Her own evolution as a swimmer has been as random, as subject to external forces and factors both large and small, as the fish in Lake Malawi. “When people ask me what I love about swimming, I’m not exactly sure,” she says. “Being good at it definitely plays a role; you usually love what you’re good at. But even as a youngster, I remember spending hours in the pool. When I was 12 or 13, I would ask my coach if I could do some more sessions. THAT LOVE would be tested in the period after the Beijing Olympics. After another bronze at the Worlds in Rome in 2009, Campbell’s next two years were derailed by illness. Glandular fever, which led to chronic fatigue syndrome in the aftermath, caused a serious drop in Campbell’s form. The girl known throughout school as the swimming champion began to question her identity. “I couldn’t understand why I could go low 24s as a 15-16-year-old, and then as an 18-19-year-old really struggle to break the 25-second barrier,” Campbell says. “Was it a fluke? Was I just one of those child wonders that flared briefly? Cate and Bronte's sister act is getting rave reviews. Photo: Getty Images. The 2012 Olympic selection trials in Adelaide were dominated by the narrative of big-name comebacks: Thorpe, Trickett, Huegill, among others, seeking one last splash. Campbell was devising a return of her own, and had to contend with a sprint field that had filled with contenders during her two years away. She ended up qualifying for both of her events, though, and came away from the trials at the centre of another neat and irresistible storyline – with Bronte finishing just behind her in the 50m, the Campbells became the first sisters to compete in the same Olympic swimming event for Australia. The London Games hit depths of infamy that inspired all manner of navel-gazing, soul-searching and official-reviewing for the nation’s swim team. Campbell, however, didn’t have much time for other peoples’ problems; she had her own to deal with. The program started ideally – on the very first night she won gold as part of the victorious 4x100m free team, swimming the third-fastest split of the final. Campbell remained one of the swimming world’s most tantalising cases of if-only. With her 186cm frame and long pull through the water, she has the physical tools that set her apart. At top speed, she’s the type of racer who can leave her peers gushing. Campbell’s focus in training has been to add strength, which would allow her to use her long levers to full effect – able to swim freestyle, as she has explained it, more like a man would. Free from her maladies, she had an ideal preparation before arriving at the 2013 Worlds in Barcelona. There were early signs at the Palau St Jordi, which was the venue for gymnastics and basketball – and not swimming – during the 1992 Olympics. On the opening leg of the 4x100m relay, Campbell recorded a 52.33 split, the second-fastest time in history. The mark of 52.07, held by Germany’s Britta Steffen, was set in 2009 when the super-suit was shredding the record book. Taking care to avoid any unhealthy situations over the following week, Campbell qualified second for the 100m behind Swede Sarah Sjostrom. In the final, she went out at a cracking pace, 0.61sec ahead of the world record. She held on to finish in 52.34, just in front of the fast-finishing Sjostrom, as well as Olympic champ Ranomi Kromowidjojo and American star Missy Franklin. Steffen’s time, once thought to be safely beyond reach in the textile suits, now seemed a realistic target. CATE CAMPBELL began her return to Europe – as did Bronte – in April at the qualification meet for the Commonwealth Games team (Cate pipped her sister in both the 50m and 100m freestyle finals at the 2014 Australian swimming titles in Brisbane). By the standards of sisters engaged in an intensely competitive pursuit, they’re uncommonly close – they live together, even hang out together because, as Cate says, all their friends are at uni during the day. In something of an inversion of the theory, Cate has attributed her motivation to Bronte: “It was always Bronte’s dream to go to the Olympics. She was the driven one, she was the one who would get me out of bed in the morning and drag me off to training. “Then we went to our first swimming carnival. She came away with four gold medals and an age championship trophy. I won a little bronze medal. That’s fine in itself if you don’t have a sister who parades around with the medals around her neck and takes the trophy to the dinner table, and really just rubbed it in my face, let’s be honest here. You would cry too ... if you'd just won gold at a Worlds, like Campbell did in Barcelona last year. Photo: Getty Images. With Australian swimming’s new diktat for better internal leadership, Campbell will be counted on to serve as older sister to the team for years to come. As a sprinter, she has a lengthy prime ahead, able to mature over time like competitors such as Dara Torres and Natalie Coughlin. As a face of the team, Campbell will find herself bearing something of the scrutiny that James Magnussen encountered coming into London. Australian swimming will likely figure out that the most effective kind of internal leadership comes from those who are leading at the end of their races. “What the public often doesn’t realise is just how competitive swimming has become,” Campbell says. “It used to be Australia, America, a little bit of Britain and China. Now we have all of Europe to deal with. And as swimming has evolved into a professional sport, more people are able to concentrate solely on training. Therefore, they’re faster – we’re seeing times that are just crazy. The new face of the Australian swim team. Photo: Getty Images. For a non-Olympic, non-Worlds year, 2014 is shaping up as very full campaign. There’s a Pan Pacs in August, to be held on the Gold Coast, not an hour from where Campbell lives. “To have the home crowd, I’ve never experienced that before,” she says. Before then, the Comm Games will be a key checkpoint for Australian swimming on its bounce-back from the London malaise. By her name alone, the Malawian-born Aussie should find some support among the Scots. “I do know a bit of history around the Campbell clan, and the rivalry that went on with the MacDonalds. My parents toured Scotland on their honeymoon. They went into a bar that said, ‘No Campbells allowed.’” That won’t be likely, one suspects, with the pool in Glasgow.